A belief that rising home prices are good is a disease that has infected our society. While speculators, banks and downsizing retirees profit in the short term, real estate inflation is not beneficial for the rest of us. That's right - increasing home prices are not good for Canada in the long term! Not only does property appreciation hurt our competitiveness, it also suppresses export driven industries. Furthermore, rising home prices result in an intergenerational transfer of wealth. Is it ethical for baby boomers to feed off of younger generations? In his book, The Subprime Solution, Robert Shiller argues that the most important factor driving speculative booms is a social contagion of boom thinking, mediated by common observation of rapidly rising home prices. The social contagion results in increasing the credibility of "new era" stories such as: Toronto is running out of land, foreign investors, and Toronto being a world class city. Furthermore, Shiller argues that understanding this social contagion is like understanding a disease epidemic. "Every disease has a contagion rate (the rate at which it is spread from person to person) and a removal rate (the rate at which individuals recover from or succumb to the illness and so are no longer contagious). If the contagion rate exceeds the removal rate by a necessary amount, and epidemic begins. The contagion rate varies through time because of a number of factors. For example, contagion rates for influenza are higher in the winter, when lower temperatures encourage the spread of the the virus in air-borne drops after infected individuals sneeze." Similarly, our society has been infected with the belief that home prices will rise into the future. During the boom years, the contagion rate was higher than the removal rate, hence the boom in the real estate industry and the housing bubble. Once the removal rate exceeds the contagion rate, then the pessimistic view of the housing market will become widespread. As that happens, the Canadian housing bubble will burst. Nobody can really know for certain but it looks like the removal rate of social contagion might be increasing. The other day I stumbled upon a poll (below) on MSN Finance. The results surprised me. While the results are not scientifically accurate I still think that the amount of real estate sceptics in this country is on the rise. That is a great sign! Furthermore, Reuters published another poll today in which 16 economic forecasters were surveyed. Below are the results. "We think it is a housing bubble. The symptoms are overvaluation, overbuilding and excessive household debt." Back in 2012 Madani forecasted that home prices in Canada will crash by 25%. He still sticks to his forecast. 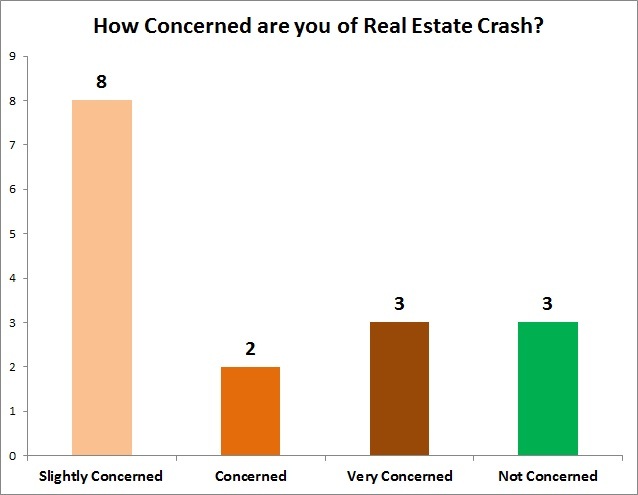 All in all, it looks like the social perception of Canadian real estate is changing. Sooner or later the critical point will be passed as a pessimistic view of the market takes over. Once that happens the road to the bottom will begin.